Hey There, Red Cross Fashionistas! With so much chatter on the web dedicated to fashion, it is time for Southeastern PA Red Cross to get in the game as it were. A short and informative visit to our national website reminded this writer of a fantastic shopping opportunity open to the public at our own Red Cross Store. 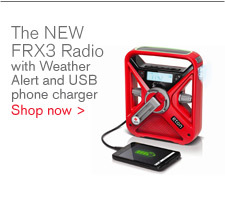 Need an incredibly stylish weather radio shaped like a cross in bright red? This is your place. It even has a USB charger outlet. Bring it, Red Cross! Prefer the hand crank version? I know I do. It seems like every disaster I’ve been a part of has always involved the loss of electrical power and missing or dead batteries. Check out this super cool item. Other hip items include this sleek water bottle – a must for any emergency kit. I love its tall, thin grey design with our bright red symbol sitting an inch or two from the base in its white circle. This bottle lets everyone know you are serious about hydration during an actual disaster or one you create for yourself, like that 10K you weren’t really prepared to run on a warm day. To my mind, the best items on offer at the Red Cross Store are in the apparel section. Check out this Vintage Red Cross Tee. Does it get any more “classic” than these? Who doesn’t have his or her eye on the red one? Although, looking again, the gray one is extremely chic. There’s also a great baseball hat that I’m planning to purchase for my brother, who is a big proponent of the” baseball cap as cover for no morning shower” technique. The best part of shopping at the Red Cross store is that a portion of the sale of these items goes to support the mission of the Red Cross. Of course, it’s important to keep in mind that wearing this apparel will not only have you looking stylish and socially concerned but also capable of assistance to others. If you are going to rock that red tee, you may also want to sign up for those First Aid classes you’d always meant to take. This, my fashion forward friends, is the ultimate benefit to shopping at the Red Cross Store: fulfilling your potential to be of service to others in need. Everyone should be prepared to help in an emergency.